I’ve been participating in Sunrise Movement trainings to raise awareness of the Green New Deal and to motivate Congress to take significant action toward 100% US renewable energy within the decade. Surrounded by a mass of college kids with a spattering of we older folks, I’ve been immersed in strategizing so that we can more effectively fight at the local and national levels to make the Green New Deal a reality. A 3-part theory of change that mobilizes millions, elects a critical mass of supportive public officials, and builds a new peoples’ alignment that advances a shared agenda for society is underway here, folks. And, should you have questions about whether a bunch of kids and an idealistic vision to restructure the way energy is done in the US is practical, just look at the numbers. More than anything, there are significant economic reasons to implement a Green New Deal. The chairman of the Global Carbon Project, a fiscal conservative who’s conscious that our US national debt is about $20 trillion, says hearing talk of a Green New Deal makes him feel “excitement and, perhaps surprisingly, dread.” Why does Rob Jackson hold these conflicting emotions? In an op-ed piece for The Hill, Jackson says a Green New Deal will repair the climate, make our businesses more competitive, and put far more people to work in green jobs. This leader of a non-partisan group of hundreds of scientists who is documenting greenhouse gas emissions points to wind and solar, which he suggests will offset the loss in brown jobs, like coal mining. And why not? The global economy is creating half a million new jobs yearly in renewable energy and employs more than ten million people. This sector of the US is moving 12 times faster than the rest of the economy. Green energy is putting people to work. Are Higher Top Marginal Income Tax Rates Feasible to Fund the Green New Deal? From 1930 to 1980, the top marginal income tax rate averaged 78%; it exceeded 90% from 1951 to 1963. What’s important to realize is that these rates applied to extraordinarily high incomes only, the equivalent of more than several million dollars today. Only the ultrarich were subjected to them. Those percentages were part of an op-ed piece in the New York Times recently from 2 UC Berkeley professors who argue that Rep. Alexandria Ocasio-Cortez’ (D-NY) tax hike idea is not about soaking the rich — they say it’s about curtailing inequality and saving democracy. The view that excessive income concentration corrodes the social contract has deep roots in the US, which was founded, in part, in reaction against the highly unequal, aristocratic Europe of the 18th century. Saez and Zucman say that Ocasio-Cortez’ call for a 70% rate for incomes above $10 million is drawing upon a US tradition of sharply progressive taxation which began in 1917. Then the US imposed tax rates as high as 67% on the highest incomes. Sure, Ronald Reagan successfully repressed this progressive taxation tradition, but we must remember that it did prevail during most of the 20th century. Moreover, the call for progressive taxation comes at a time of national emergency: a climate crisis and an inequality crisis are crippling US economic growth. The income of a tiny minority has skyrocketed. The highest 0.1% of incomes have grown more than 300%. For the top 0.01%, incomes have grown by as much as 450%. And for the tippy-top 0.001% — the 2,300 richest Americans — incomes have grown by more than 600%. The US is poised is taking a powerful economic hit from climate change. Heat waves, wildfires, extreme weather events, and rising sea levels are costing the country in lost labor, weakened coastal real estate values, reduced crop yields, health problems, and crumbling infrastructure. The Fourth National Climate Assessment predicts the US economy will shrink by as much as 10% by the end of the century if global warming continues as is the current pattern. When asked about climate, Trump sticks by his position that “It’s fine.” What about the dire predictions of economic losses? “I don’t believe it,” he insists. Jackson says a strong economic reason for the Green New Deal is that we’re already paying the costs of climate change today. We suffered $306 billion in damages from hurricanes, fires, and other US disasters in 2017 (the last year data are fully available) — a hundred billion more than ever before. The insurance industry was among the first to acknowledge the costs of climate change. An example of the economic costs are in California, where the biggest utility, Pacific Gas and Electric (PG&E), is about to declare bankruptcy. A judge recently and tentatively concluded that power lines may have caused November’s deadly Camp Fire, which killed 86 people and caused about $17 billion in damages. Cal Fire determined PG&E equipment sparked more than a dozen fires in 2017 that cost $15 billion more. Science News has compiled a likely list of climate change-related US economic losses by the end of the century. However, there’s also the possibility of an alternative scenario, where the US and world takes modest actions to curb greenhouse emissions, including using more carbon-neutral fuels and the growth of technological innovations to remove carbon dioxide from the atmosphere. 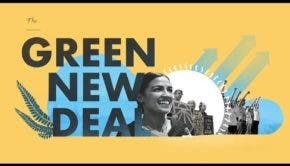 The Green New Deal is a necessary step toward that alternative version of tomorrow. Acknowledging that the US government has a record of spending money quickly and badly, Jackson admonishes legislators to spend money directed to the Green New Deal as wisely as possible.